Your house number is very important. If you have an emergency, that is the first thing you will be asked: WHERE is your emergency? Where you put your house number is also very important as it must indicate which house it is, especially on roads where the mail is delivered on one side only. Please make sure that your house number clearly indicates which house that it belongs to. Placing the number at your driveway is a good way to identify your home. Remember that emergency personnel need to see your number in foggy and rainy weather as well as on a clear day. Use reflective, Arabic numbers a minimum of 3 inches in height. Mount in a secure fashion to the principal building’s front wall, porch or other fixed appurtenance in front of the building in the general vicinity of the main entry way or main path of travel which leads to the main entrance from a street or upon a post or mailbox in the front yard of the premises. If mounted on a post, the post must be no more than 6 feet above the road grade. Numbers must be significantly legible as to contrasting background, arrangement, spacing, size and uniformity. No trees shrubs or obstructions should block the line of sight of the numbers from the center of the street. Numbers should be visible from both directions of travel on the street. Charlestown has an Emergency Operations Plan (EOP) that is designed to provide prompt and effective emergency response procedures to be followed in the event of a major emergency or disaster to protect the health, safety and welfare of Charlestown residents. The Charlestown Township Emergency Management Coordinator is appointed by the governor of Pennsylvania and acts on behalf of the Board of Supervisors. All municipalities are required to have a coordinator. The Emergency Operations Center consists of computers, communications and other equipment to be used in the event of an emergency that might affect the residents of the township. Examples of these emergencies include: flooding, storms, tornados, hazardous materials accidents, and nuclear plant incidents. The volunteers take part in various training activities hosted by Exelon and the Chester County Emergency Management department, and participate in practice drills. Charlestown has eleven volunteer members of its EOC, and we welcome your involvement. Please consider joining us! Philadelphia Electric Company (PECO), a member of Exelon Corporation, maintains a nuclear power generating plant within ten miles of Charlestown Township. Exelon has provided safety information for area residents in the form of an extensive brochure which is updated yearly. 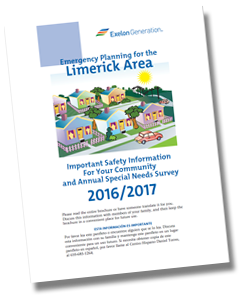 A guide to area emergency services with exit routes and helpful safety information. Receiving a Recording When Calling 911 — Do not hang up! Occasionally, usually during severe storms with wide-spread power outages, more 9-1-1 calls are made than can be answered. During these times, after a few rings the caller will receive a recorded message letting the caller know that they have dialed 9-1-1 and all telecommunicators are busy. The recording will instruct the caller to stay on the line, except if they are calling to report a power outage. If this is the case, the caller will be instructed to call their electric provider. Even during these busy times, callers should not hang up once they have dialed 9-1-1. Even with a hang up, we still receive your phone information, and have to call back and verify that you do not need assistance; this COULD DELAY HELP FOR SOMEONE ELSE WHO NEEDS IT. If you dial 9-1-1 by error, simply let the call-taker know when they answer the call. The call-taker may ask some questions to verify that the call was dialed in error and that you truly do not need help. If you have questions about calling 9-1-1, feel free to contact us at 610-344-5000 and ask to speak with someone in the 9-1-1 Operations Division or Public Information Officer. The Chester County Health Department has provided safety tips for food safety for when the power has been restored to residents in Chester County. If a thermometer has not been kept in the freezer, check each package of food to determine its safety. You can’t rely on appearance or odor. If the food still contains ice crystals or is 40° F or below, it is safe to refreeze or cook. Throw away any food that has a temperature of more than 40° F.
Refrigerated food should be safe as long as the power was out for no more than 4 hours and the refrigerator door was kept shut. Discard any perishable food (such as meat, poultry, fish, eggs or leftovers) that has been above 40° F for two hours or more. Do not refreeze thawed vegetables. Spoilage may begin before bad odors develop. You can refreeze vegetables only if there are ice crystals remain throughout the package. Any question on the condition of any vegetable, discard them. Any meat or poultry that has an offensive odor or has been in the freezer with a temperature of 40°F or higher for 2 or more hours should be thrown away. Discard all stuffed poultry. Cooked meat can be refrozen. Do not trust your sense of smell. Fish and Shellfish are extremely perishable. Do not refreeze unless there are ice crystals remain throughout the package. Ice cream, do not refreeze melted ice cream. Throw it out. Do not use contaminated water to wash dishes, brush teeth, wash and prepare food, wash hands, make ice or make baby formula. Use baby formula that does not need to have water added. If you used bottled water, be sure it came from a safe source. Use only bottled water, boiled or treated water until your supply has been tested and found safe. Boiling water, bring to a rolling boil for 1 minute will kill most organisms.